I did judo for 16 years and did taekwondo, jujitsu for 1 year. I find martial arts really interesting and that why I want to learn Shaolin, because it is the origin of all martial art,so I came to kunyu mountain academy. Not only did I get good stamina, power and flexibility during the kung fu training,but also people who I can actually call family, the people at the academy are my greatest gain.Seeing how good the long term students are really make me want to push myself beyond my limits. Not only did my master teach me a lot, I also learn a lot from my fellow students. Also seeing my master at the competition made me want to push myself even harder.The training is amazing and I love every second of it. The masters are better than i could have wished for, they are so experienced.My master is the best in my opinion, his way of teaching is strict but he himself loves to smile. This made the training fun. The surroundings are the reason I chose this school. The lake is wonderful to relax after training. The mountains are beautiful and I loved doing clamps up and the mountain run. The air is cleaner than I expected, I thought there would be nice. Yantai is a fun place to visit as well as Muping, there is so much to see and after two month I still haven’t seen everything. I want to thank you for these two wonderful months! I will definetly come back here for a year. I chose China because Kungfu has its origin here. I was motivated to study Kungfu for two reasons: firstly i wanted to improve my fitness and skills because i enjoy exercising and i also want to maintain a good health. 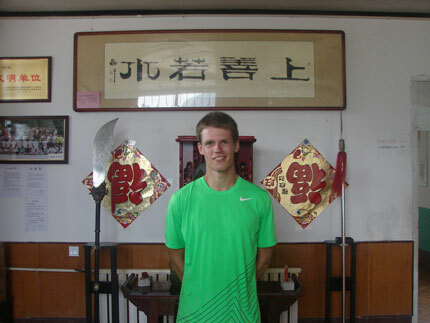 Secondly, i saw Kungfu practice as a chance to develop my personality and find out more about myself. Actually, i expected to learn more about the attitude of Shaolin Kungfu. I read that Shaolin monks have a very grateful attitude towards life and that they have a certain morality. My greatest gain here is fitness. I improved a lot and also learn many new skills and methods of training. 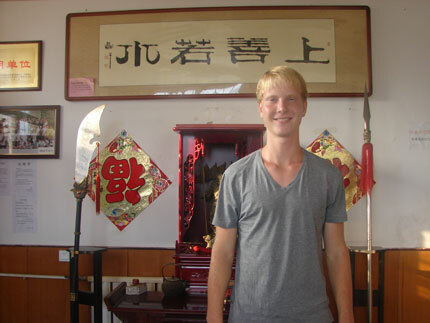 Moreover, my Chinese improved a lot due to the great help of translators and the contact with Chinese students. Apart from that, i think that i am more self-confident now when it comes to the fighting in everyday life.Especially the translators were very supportive and helpful. I could also feel the team-spirit in my group and also the whole academy, some students helped me with Sanda or acrobatics training, and they motivated me to keep . My master taught me well. I think the most important thing to say is that it is a very interesting life because there is always new people and you can train and learn all day. The time fly here. I respect the masters a lot, they make the training here a great experience. The food and the water supply are fine, the sanitary facilities and laundry facilities suit my needs.The surroundings are perfect, nice landscape, a lake, a temple, a city for business and free time-off you need.